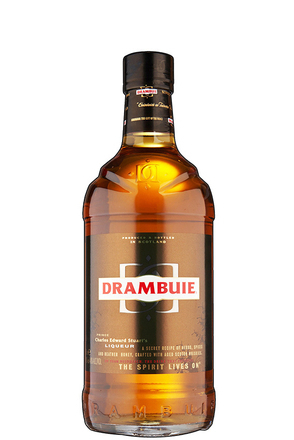 Scotland's most famous liqueur and one of the most recognised of the great classic liqueur brands, Drambuie has a fabulously complex flavour profile and a heritage which stretches back to the 18th century and the son of a deposed King of England. Drambuie is still made using the original secret recipe perfected by Malcolm MacKinnon in the early years of the 20th century. 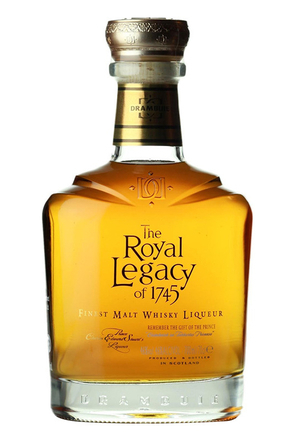 Then, as now, it is based on Scottish grain and single malt whiskies, many of which are 15-17 years old. Drambuie hold an incredible 71,000 casks of maturing whisky with the oldest dating back to 1971. Over the years the number of different malts used in the blend has reduced from 30-35, back to a far more manageable number but the profile of these is stricter than ever with only light to medium bodied malts with the desired fruity, estery, honey and vanilla character considered. The grain whisky content has also been refined to three from as many as seven, but again the quality assessment is more rigorous than ever and a proportion of this grain whisky is aged in ex bourbon casks. It is worth noting that Drambuie only buy 'new make' spirit direct from Scottish distillers to fill casks sourced directly from bourbon distillers. Drambuie never buy aged whisky, preferring to age themselves in warehouses they control. Drambuie's base whisky blend consists of approximately two-thirds grain to one-third malt, and of that malt, around one-third is very old malt whisky. This grain and malt whisky base is flavoured with the secret herbal essence (unchanged from the formula perfected back in 1908 by Malcolm MacKinnon), proprietary sugar syrup (which includes heather honey) and the merest touch of glycerine to bind the flavours and add mouth feel. All the way though the complex blending process, secrecy is maintained with the precious oil based essence held in highly secure locked vessels. We were lucky enough to be taken into the inner sanctum of Drambuie, the locked 'Essential Oil Room' where the herbal essence itself is blended. Here we were not only unusually given the chance to nose the top secret essence but also to attempt to blend our own Drambuie. Being given these ingredients and free access to the equipment in the blending room served to illustrate 1/ what a skilled job blending is, and 2/ how incredibly concentrated the essence which forms the flavour base of Drambuie is. A single drop of the herbal essence in a 500ml sample blend was far too much with the result being far too strongly flavoured. 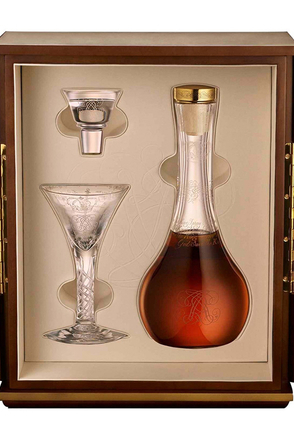 Even if you were actually given the recipe, just blending the essence in the correct proportions with the whiskies and other ingredients would challenge even the most highly experienced blenders.